As Vermonters, we take great pride in the fact that Vermont farms and woodlots have produced maple sugar for five, six, or more generations. Can we securely project that Vermonters will have the same opportunity in generations to come? It’s not a simple question. The impact of climate change on sugarmaking cannot be precisely measured, but we believe the subject is worthy of further exploration. North Road Sugar Works​ is a 501(c)(3) non profit organization advancing an analysis and understanding of future climatic impact on sugar maple trees. Our focus will be on community based environmental education with a definite emphasis on the sweet science of making maple sugar. NRSW will offer an opportunity for dialogue and voicing concerns about the challenges to future generations of maple sugar aficionados. Vermonters, maple sugar producers. Visitors will have a forum for sharing their observations, thoughts, and concerns with a wider public audience, perhaps even a national or global one. One of those venues for dialogue will be online, and at some future date, via live camera feeds, we will open the door to real time maple production. North Road Sugar Works will host an annual pancake supper and lecture in the Vershire Town Center, in nearby Vershire Village. These events will occur on the second weekend after Town Meeting Day, the first Tuesday in March. Notable guest speakers will be an important part of the celebration. The first speaker speaker, John Elder, a retired professor of English and Environmental Studies at Middlebury College, inaugurated the series in March 2015. In March 2016, Bill McKibben, the widely respected environmentalist, is on the schedule. During the sugaring season, (January-April), North Road Sugar Works will demonstrate sugarmaking to children in nearby communities. Westshire Elementary School in West Fairlee, VT and the Montshire Natural Science Museum in Norwich, VT are on board to be local supporters of NorthRoad Sugar Works. Outside sugaring season, the sugarhouse will illuminate other aspects of the maple trade. In the fall, firewood will be cut, split, and piled in the woodshed for fuel in the coming spring. At the Vershire Fall Festival, the second weekend in October, maple sugar grading, tasting, and sharing of recipes would be part of the celebration. 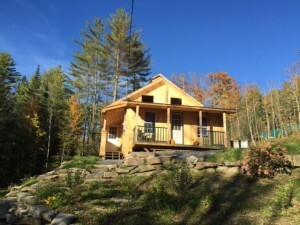 To learn and exchange information regarding established sugaring techniques as well as new technology in the maple world. As the climate changes, the economics of maple sugaring is sure to change with it. As more people come to understand this concept, the better armed they will be to make good decisions at the grocery store, identify areas of climate denigration, and make an informed, market-based statement about agents of climate-unfriendly conduct. To discuss what we see happening in the woods and to sugar maples in particular. Can we ascertain what is the impact of climate change, on our maples in particular? We will look into if and how different maple producing zones are affected. To use maple production to celebrate the hard working people of Vershire, Vermont, and wherever else maples grow and syrup is made, promoting a strong, regional maple economy. To communicate with local maple producers, equipment manufacturers and consumers about the need to consider what the future of sugar making might look like if we ignore what is happening to our climate. We think that acknowledging and addressing climate change will be good for the maple business. North Road Sugar Works will encourage local participation by purchasing sap from residents who have maple trees on their property but don’t have the equipment or experience to produce maple syrup on their own. A neighbor has committed a 900 tap sugarbush to the project. At an average five taps to a gallon of finished syrup, this should produce approximately 180 gallons. The sale of syrup in smaller volumes (half-pints, pints, quarts) should calculate to a market price of approximately $100/gallon, resulting in a first year revenue goal of $18,000. The cost of bottles, labels, fuel, and labor would most likely add up to close to that total, making the enterprise more or less breakeven. sap outright. The expectation is that annual revenues will cover annual costs. The building itself is nearly finished. 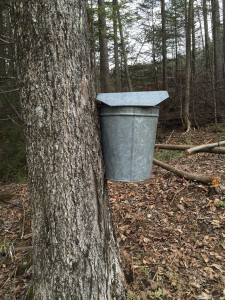 Remaining costs consist of some interior finish work and equipment necessary to tap 900 trees, haul and store the sap, boil it into syrup, and finally can and distribute the finished product. Where it will get sold has not yet been determined, but the connection with the aforementioned four goals will guide the marketing. Our total fund-raising goal is $100,000. This is a one-time cost. Once the operation is up and running, it will strive to be self-sustaining. Marc McKee has been devoted to the practice of maple sugaring since he moved to Vermont in 1975. 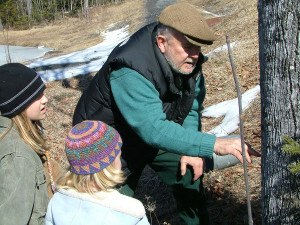 After some years of tapping his own maples, he developed and managed the Mountain School sugarbush in Vershire, Vermont. From 1987 to 2012, with the help of 45 enthusiastic 16 years olds, as well as some interested, equally willing faculty, every sugaring season he boiled sap from about 800 buckets. Over that 25-year period, he witnessed changes in the climate that he does not fully understand, and he hopes will not result in a Vermont without maple trees. This project is his response to those concerns. We hope you can support North Road Sugar Works and its mission for community-based environmental education.